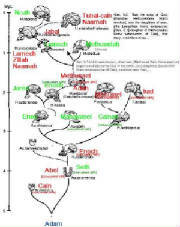 The text of Genesis 5 compared to the present paleonotology. 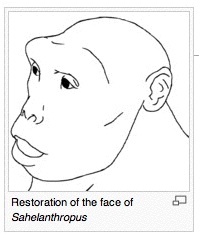 ... and blessed THEM, and called THEIR name Adam (Sahelanthropus tchadensis), in the day when THEY, (the first hominoids),were created. A close reading of the scripture (Gen 5:2) supports this idea of Paleontology/Genealogy because the text states that "THEY" are called Adam. GENETIC FACTS: Genetic evidence now reveals that 7 million years ago, by an Act-of-God, a mutation inside the womb of a mother Ape, fused together two for her 24 chromosomes, and created an new species which has only 23 chromosome pairs. That birth of the species called Adam, Gen 5:2, has since been passed down to each of use alive today. On the ends of every chromosome, you should find special genetic markers, or sequences of DNA called "telomeres." And in their middles, you should find different genetic markers called "centromeres." But if a mutation occurred in the past, causing two pairs of chromosomes to fuse, we should find evidence in those genetic markers: telomeres not only at the ends of the new chromosome, but also at their middles, and not one, but two centromeres. This evidence has been found in Chromosome Number 2. All of the marks of the fusion of those chromosomes, predicted by common descent and evolution, all those marks are present on human Chromosome Number 2. Finding a structure like this in our chromosomes explains why humans have one pair fewer than the great apes. (Sahelanthropus tchadensis), lived were nine hundred and thirty (thousand) years: and he died. 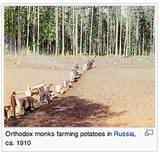 Gen. 5:8 And all the days of Seth, (Australopithecus anamensis), were nine hundred and twelve (thousand) years: and he died (out, extinct). 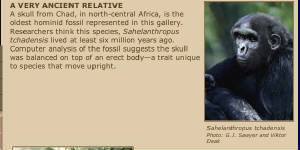 Modern Paleontologists insist man evolved from twenty-two (22) "species," now exrinct. While Genesis 5 ALSO reports 22 names, most likely eponyms which also stand for 22 different "types" or "kinds" of man. One may choose to see this genealogy of 22 names as referring to actual individuals, but then the problem of their inordinately long lives defies reason and science and common sense. That a modern look aligns these same 22 names with species, now extinct, seems an optional interpretation which has the advantage of conforming to what is the truth of this moment.